A few years in a new city have already inspired for me repeat viewings of newly discovered events and productions and places and people. We return when we feel inspired, we return when we feel welcomed, we return when we feel that we’re of service. And after two years in New York City, inspired by my established love for working with young people finding their voice in theatre (ah yes, the Goodman-AWJ Young Critics Circle program, let us replicate you), I return again and again to the delightful, delicious, enthralling and supportive Manhattan-based Young Playwrights program. As reader of submitted scripts for their various competitions, as dramaturg for the annual conference of playgoing and readings for the winners, as dramaturg for their week-long summer program for young writers called “Urban Retreat” — I’ll do anything for them. They’re that good. This week we are deeply ensconced in the 2012 edition of the Young Playwrights Urban Retreat and it is a wash of activity and a wonder to behold. I have the privilege of speaking to the current group of 15 or so participants during, as the program materials describe it, one of the “luncheon roundtable discussions related to the craft and business of playwriting.” I talk about my experiences as a dramaturg (reading scripts, working on productions, writing reviews, working with playwrights) and am terribly impressed by the energy and enthusiasm and intelligence of these young people. Because their week starts on Saturday and I am Sunday’s lunch speaker, I am the first to discuss at length with the group the idea of, the definition of, dramaturgy as it is described and practiced in the United States. The group returns to the concept repeatedly over the week of their activities in workshops, attending shows (this year they see The Best Man, One Man Two Guvnors, Dog Fight, and End of the Rainbow as well as attend a professional play reading), and preparing to write their own short plays. 19 July 2012. 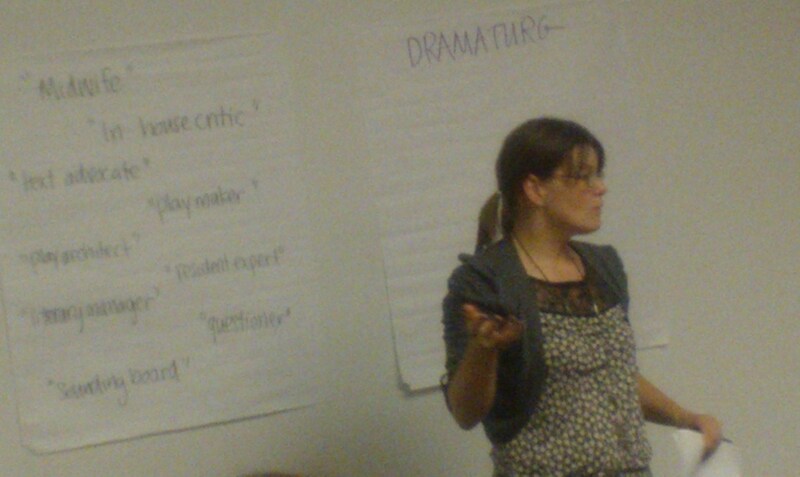 Elizabeth Bojsza takes Urban Retreat participants through some of the characteristics, functions, and roles of dramaturgy. Image by Martha Wade Steketee. The YP program is deeply invested in modeling the idea of dramaturgs as partners in theatre-making — so much so that, as the program materials describe, the playwrights are each paired with professional dramaturgs toward the end of the week as a consultant/discussant/resource to them as they work on their own short plays. Before the playwright-dramaturg pairs are assigned, program Literary Manager Elizabeth Bojsza holds a mini-seminar with the playwrights and dramaturgs on roles and functions. Asking questions, serving the play, not rewriting but listening and observing — these are some of the key concepts we discuss during this first chat and each of us will explore in our time together. The participants are given a “commission” involving limitations and selected elements. One day the writers draft, the next day they redraft and see their pieces read by professional actors, and the final evening this year the pieces will be presented as program of short plays at Playwrights Horizons. I am in awe, and feel privileged to work with these young talents. And now I head off to hear the new version of my playwright’s work. I cannot wait. Tagged as: Cindy Bandle Young Critics, Urban Retreat, Young Playwrights Inc. I enjoyed reading this article very much! I am teaching a dramaturgy class for the first time this fall at a high school. I am trying to make it relevant and exciting for my students. If you have any written version of your experiences, tips to share or suggested texts, I would be most appreciative. I am reading everything I can get my hands on at the moment! I am thrilled to have the opportunity to teach the course and want it to include many practical/real-world applications from people working in the field so my students get the most out of it. Thanks so much! I would really like to attend the event next year! I am also a writer and it seems like it would be so beneficial on many levels. Perhaps our paths will cross someday!